Varying job conditions will affect total labour hours on projects. Understanding this is the key to successful estimating, writes Labour Unit Manual author Brian Seymour. There’s a world of difference between estimating labour for an installation on a construction site and estimating for a benign, closed environment, such as a commercial premise. All of them have an effect on the project’s cost. Irrespective of the size of the project or budget, estimating an installation can be a daunting task. To create a workable estimate, you must thoroughly understand your crew’s strengths, weaknesses, skills and processes. Standards. This will ensure that you cover items that you and your potential client may not be aware of. As an estimator, you must have the ability to define a project’s purpose, and you should consider your current resources and previous projects of a similar type. Installation is a labour-intensive process and needs solid working relationships with the installation crews so that they are part of the estimating function. You must own your role and responsibilities and have hands-on experience to alert you to factors that could cause a cost blowout. The scope will explain the boundaries of the project, establish each team member’s responsibilities and set up procedures for verification and approval of completed work. Once the scope is understood and you are comfortable in complying with the tasks, attention can be turned to process and installation method, which is reliant on resources, workforce skill and availability. An understanding of the scope. An understanding of architectural and schematic drawings. Knowledge of installation materials and methods. An organised method of take-off. Evaluating subcontractor and supplier estimates. Selecting subcontractors and suppliers that can meet the scope. An understanding of construction methods and materials. A detailed process for following up on why projects were accepted or rejected. Good-quality estimating software is a great tool for speed, eliminating repetitive mundane work and reducing human error. However, few computer programs take into consideration many of the environmental conditions mentioned above. It is a mistake to rely on software without an internal control mechanism that guards against errors and omissions. It needs a free-thinking human being to ensure this control. Many computer programs don’t keep up with price changes for materials, and they need to be refreshed on a regular basis. It is important to use real data in your estimating process rather than dated information. Estimating materials is not rocket science if you know your trade. However, if you are not familiar with specified catalogue numbers, it can spell disaster. For instance, confusing the catalogue number for hazardous area lighting fittings with the number for bare tube fluorescents could be the difference between a successful project and a catastrophe in electrical work. Much greater skill is required when assessing installation labour. The time that a worker will take in performing a unit of work varies according to the individuals, projects, climatic conditions, job supervision, operational complexities and other factors. It requires more time to install fittings at 4.5m above floor level than at 2.8m. Therefore, the installation productivity is defined as the quantity of work produced in a given amount of time by a worker or a specific crew. To estimate productivity, an estimator needs a good historical record and a lot of experience. It requires the estimator to understand that in specific instances a ‘degree of difficulty’ may have to be applied. This occurs when the installation is affected by one or more of the environmental factors mentioned above and is usually expressed as an added percentage to the labour hours. This also includes issues such as ‘walking time’ (time to get the workers to the workface), which may be time taken to access the higher floors on a multi-storey building or relocating from the car park or site shed on a large industrial site to the workface. Access for labour, materials and equipment. Will it affect the program? Will it affect the liquidated damages? Price agreed before works start. Do the workers have the required skills? Do they require specialised training? Do they understand the specific requirements of the client? For plant and equipment, do you purchase or hire (scissor lifts, cherry pickers, etc)? Does it require out-of-hours ? 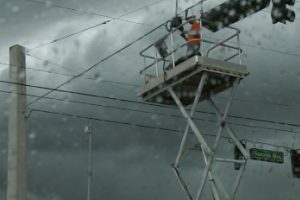 Wet weather can be a hazard with electrical equipment and plumbing services. Hot weather can require site shutdown. You should always use sound judgement and common sense when preparing estimates. Take on board the above factors: it may mean the difference between profit and loss for the company or client. Approach each estimate with a professional attitude and examine in thorough detail all areas of the work. Set aside specific times each day for entering estimated quantities and data without interruption. Total mental concentration is a basic requirement for preparing accurate estimates. It is important to allow enough time to research and become familiar with the background and details of the project, complete the quantity survey and review various aspects of the project with the other disciplines involved.